Everyone's got their favourite Vietnamese restaurant in town for one reason or another, but for me, whenever I get a craving for Vietnamese food — and for phở in particular — the 55B (with pork and rice noodles) is all I need to make a beeline to Golden Bell Saigon and spurn the other establishments. 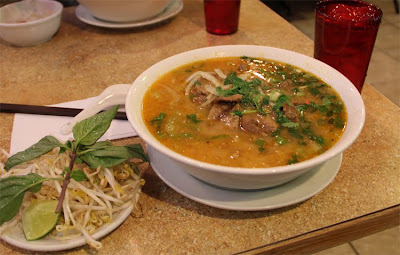 The long-form menu description of this phở variant is “charbroiled pork, beef or chicken in satay rice or egg noodle soup” ($10.25). I favour the pork because it carries the charbroiled flavour within the soup better than the other two protein options. And given that the broth is already steeped with peanutty and spicy tones (not to mention the usual garnishes of lime, Asian basil and bean sprouts), the melding of flavours is nothing short of amazing. The phở purists can cling to the simplicity of their beef brisket / tripe / tendon in clear beef broth. Me? It's gotta be the rich complexity and brightness of item 55B. Clouds and swirling snow crawl over sharp Rocky Mountain peaks as we sit window-side at Juniper Bistro in Banff’s Juniper Hotel. The sun cracks through these fast-moving swirls, fanning snow-covered pines with rugged Jesus rays. It’s a divine sign that we order the eggs benedict ($15). She’ll have the Canadian bacon, while I’ll have the smoked salmon. We admire the construction of a shallow birch-bark canoe ornamenting the divide between the restaurant and its lounge. Speaking of ultra-Canadiana, there’s a very cool Norval Morrisseau painting entitled “Medicine Wheel” in the small hotel’s main hall. The eggs arrive, two each, smothered in perfect Hollandaise. The yolk runs golden with the first forkful. Crisp wedge fries accompany. The salmon is smooth and almost sweet. The bacon is likewise soft and smooth but with a salt edge. I lean back and enjoy the food-fuelled feeling of leaving work and the worldly concerns of 2011 far behind. Over this exhilarating breakfast we vow never to take Calgary’s very proximate mountains and foothills for granted. Reinforcing the excellence of our meal, we scored a cheap mid-week rate for our two-nights of accommodation. Stomachs full, we’re off to Lake Louise to see the sights and enjoy an early evening sleigh ride round the lake. I would like the Cuisinart Stand Mixer with the 800W motor and 12 mixing speeds including fold function…. It’s almost Christmas Eve, so it’s time to bake the cookies for the big man in red. At our house, Santa usually gets snickerdoodles (a light cinnamon sugar cookie) but this year we’re branching out. I belong to a cookie recipe club. The group’s last recipe of the year was chocolate peppermint pinwheels. Sounds tailor-made for St. Nick, so off I go. The best thing about this recipe is that if you have leftover peppermint candy canes lying around the house (and who doesn’t) you can use them cookie filling. Vent your holiday frustrations as you whack those candy sticks with a rolling pin! The dough is your typical no-egg, vegetable oil, sugar and flour recipe split into two equal portions. Add cocoa powder to make the chocolate half and peppermint extract to make the peppermint half. After rolling both the dough portions out, sandwich the candy bits between them and roll the whole thing up. Slice into circles of yumminess. Not only are these pretty to look at next to your tree, they also taste great. A freelance writer whose food stories have appeared in Avenue magazine, Calgary food blogger and friend-of-Slop Anh Chu launched I Came for the Food in August 2010. 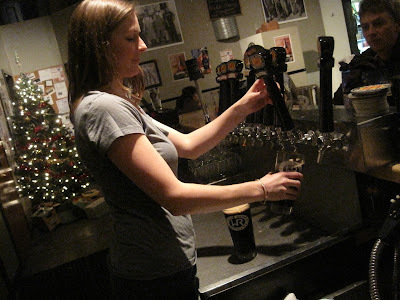 Aside from beefing up her writing portfolio, she wanted to broaden the local food-blog horizon. “There were no food bloggers who specifically covered cheap meals for real people,” says Chu, pictured above, right, taking high tea with comedian Joanne Lau. “All the same restaurants with PR expertise seemed to be getting all the press, which seemed unfair given the hidden gems in Calgary.” Also, she says, “I just love food.” Chu’s buttery prose soon landed her a weeklong gig on A-Channel’s Big Breakfast Best Burger segment. As blogs, go, I Came for the Food was high-profile. However, a short time ago, Chu up and moved to London, England, leaving her blog in apparent limbo. Slop recently contacted Chu in London demanding to know its fate. what's the fate of I Came for the Food? Anh Chu: I have a few ideas for the blog, but they haven't been executed yet. Settling in to a new country, getting sick twice in as many months, not to mention an unfavourable conversion-rate, are but a few factors that have resulted in a lack of posts of late! I have a backlog of Calgary restaurant reviews I still intend to post, and I also plan on blogging about food in London. When I began the blog, I knew it wouldn't always be Calgary-specific so I named it with that in mind. It will still be I Came For the Food. And truly, I travel a lot of places just for the food. I may also broaden the scope of my posts, so it's not so review or location-specific, but speaks to the universality of food and how it acts as a bridge to bring people together. The fact that meals are not merely about eating fascinates me. All this said, the blog is constantly a work-in-progress. Living in London has given me a greater appreciation for Calgary's quality restaurants and burgeoning scene. It makes sense to blog about the food culture, "oddities" and trends here as well. I am also still doing some magazine writing about food trends in Canada. The culinary world is so exciting. I am constantly hungry, and my mind is on food about 80 per cent of the time. We all gotta eat and consumers are getting more and more sophisticated in all things food-related. I wish my blog could be all the things I envision in my head... it's just tough to find enough hours in the day. It's a labour of love for sure. As if you need another excuse to drink this holiday season, here's a great one from the good folks at the Wild Rose Brewery. They like to celebrate the seasons with limited release beers (they had a spectacular set of four beers for the Spring Solstice), and today - with the Winter Solstice upon us - they've got another for us. Taking a cue from their just-ended, highly-heralded Cherry Porter seasonal, their NocturnAle is a rich brown ale with chocolate and toasted coconut. And it's delicious, perfectly balanced in flavours and highly drinkable. My only complaint - and all of their darker beers suffer from this - is that it's served too cold. So buy two pints, and let the second one warm as you drink the first. 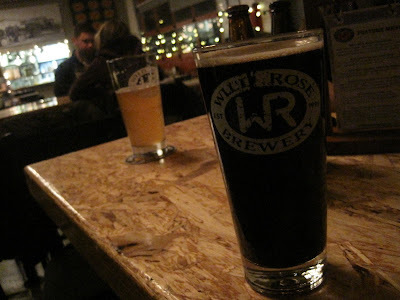 NocturnAle is available for what I'm told is a very limited time, and only in the Wild Rose Brewery taproom. Here at Slop, we like our parties to revolve around good food, so we tend to spend each New Year’s Eve in a restaurant. Nice, thick and delectable Alberta steak is an obvious fit for the occasion, but consider instead a seafood countdown to 2012. 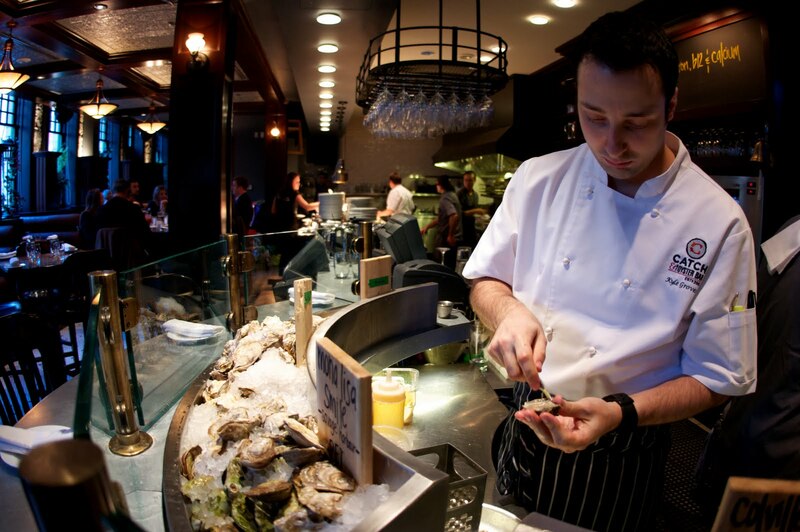 Catch is known to serve one of the city’s most delectable New Years Eve meals. Closed for renovations for most of the past summer, the two-level seafood restaurant reopened September 23. The Oyster Bar has been made, well, a little more oyster-bar-like. The shellfish are more front-and-centre with the kitchen now wrapping around the length of the bar. The upstairs has had a full makeover. What was a standard white tablecloth layout has been sexed up with red leather couches, lots of wood accents, wine-aphernalia and a gold safety deposit box art installation. 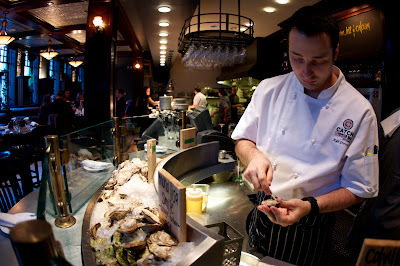 As with The Oyster Bar, the existing open kitchen has been further opened up. 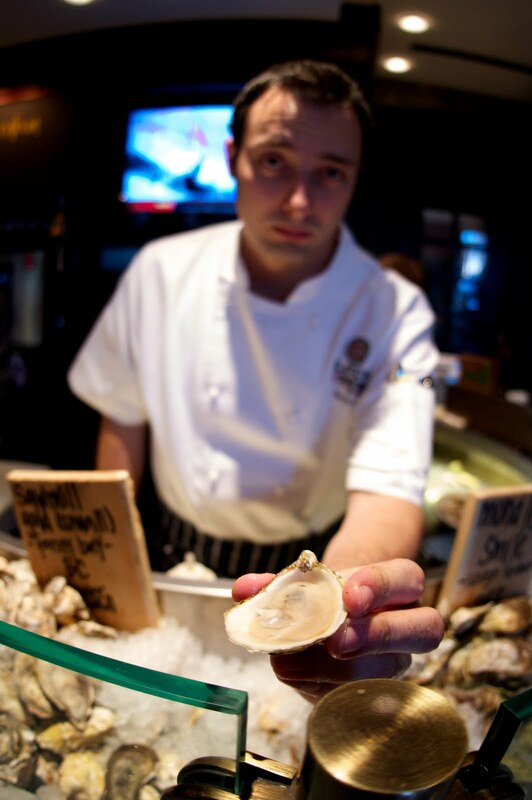 Known for his unembellished yet sophisticated seafood, executive chef Kyle Groves (pictured above, photos by Arif Ansari) oversees both Catch and The Oyster Bar. He’s added a selection of pre-appetizer small plates (billed as culinary aperitifs) to the upstairs menu — table-smoked B.C. Kusshi oysters for e.g. There are also a few new items on The Oyster Bar menu. This year’s Catch New Year's Eve meal is a three-course lobster fest for $80 per person, with the presentation varying slightly between upstairs and down. It’s Christmas time and that means one thing. Cookies. Usually, I wait for inspiration to tell me when to get my baker’s hat on and whip up a few (or 20) dozen but this year it came in the form of a present. I got my hands on a copy of The Gourmet Cookie Book. Gourmet magazine put together a lovely compilation of the best cookie recipe of each year of the publication from 1941 to 2009. Never being one to back down from a best-of list, I briefly considered baking them all from oldest to newest but quickly narrowed down to three must tries. The first were lemon thins (pictured above) from 1976. 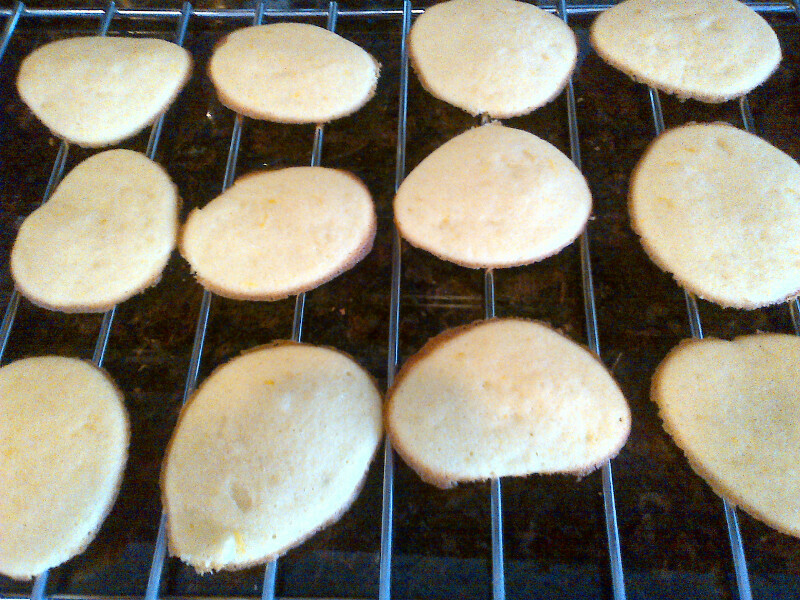 Looking at the recipe’s simple ingredient list of eggs, sugar, vanilla, lemon zest, butter and flour I wondered how these would differ from the tiny shell-shaped frou-frou French morning biscuits called madeleines. The difference? No shell shape. So, I guess 1976 meant throwing off your inhibitions (or moulds) and baking your cookies au naturel. These are exactly like Madeleines right down to having to beat the eggs and sugar together for the length of a whole Sigur Ros song. The second recipe I tried was the ginger snap cookies from 1965. I assumed that these would be classic ginger snaps. With a healthy dose of molasses, ginger, cinnamon and cloves these are a no-brainer. The recipe’s author explains that if you make your cookies a bit thicker and cook them for a bit shorter time you can make your ginger snaps into ginger chewy cookies. Yum! This is a great recipe if you have a tiny pair of helping hands, as there is the last step of dipping the dough in sugar before placing them on the baking tray. These were a hit with all three generations living at my house. The last recipe I tried was the one that intrigued me the most. The 1942 honey refrigerator cookie recipe was the product of wartime sugar rationing. This meant using honey as the cookie sweetener. My Scottish grandmother used to make a version of this cookie every Christmas, so when I saw this recipe I knew I’d make it. I also knew it would be different than what I was used to. It called for brown sugar and walnuts, and hers was a classic white sugar and honey cookie. The Gourmet recipe also called for the dough to be cut and baked. However, my grandmother’s were rolled out and the cookies cut into Christmas shapes. The dough takes a bit of time to prep, and then there is the torture of letting it chill in the refrigerator for one or two days. Not hours people, days. Still, I was prepared to commit. Strangely, once these were finally sliced and baked they tasted much more like my Italian grandmother’s honey nut biscotti than the Scottish honey cookies. Barely sweet and a bit crumbly and soft, I really liked them. Serendipity I guess — I had been looking for a good biscotti recipe anyway! What will I bake next? I’m not sure, but I left the cookbook out and my cookie tasters pointed to the strawberry tart cookies from 1993, the pecan treats from 1981 and the chocolate hazelnut brownies called gianduia from 1998. I aim to please. Did you catch a case of food truck fever this summer as it rolled all over Calgary? Well, don't think that just because Old Man Winter is upon us that you will have to wait until next spring to get your fix. Several of the local trucks will be working right through the winter months and some — like Fiasco Gelato, which now offers soup — have even expanded. This cabernet sauvignon is produced in the Bendigo region of Australia, 150 kilometres northwest of Melbourne. We purchased a bottle for $21.50. The winemaker suggests a medium-term cellaring for the 2008 to “reach its full potential.” We let it sit on our kitchen counter an entire day, so we ought to be good, yes? Sure thing: Erin is soothed by the wine’s creaminess. If breakfast is the most important meal of the day, then there’s no reason why it shouldn’t also be the tastiest. In search of something warm and toasty for breakfast, I go to the place that serves arguably the best lunch sandwiches in the city. That, of course, is Caffe Mauro. 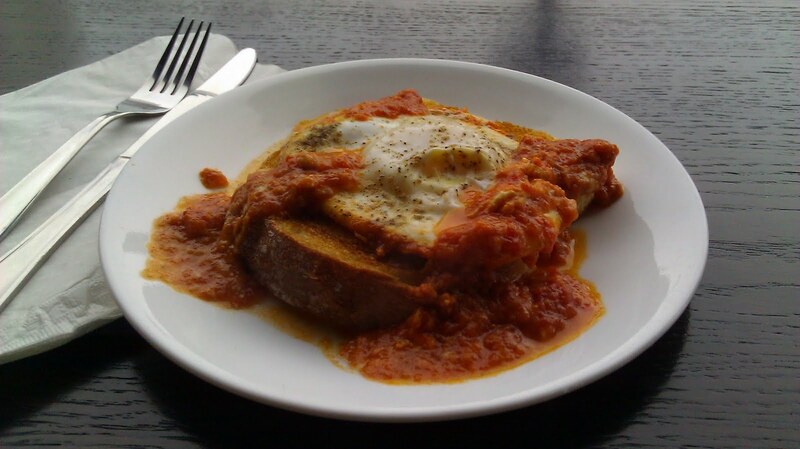 The prosciutto bocconcini and chicken Parmigiana sandwiches set the gold standard for mid-day fare, but early in the morning, I opt for the poached egg in tomato sauce ($6.25). This is miles above the usual egg-on-toast platter. The tasty, spicy sauce gives me the jolt I need in the morning. The yolk is poached to perfection — it’s slow-motion runny, like molasses on a cold day. And, Caffe Mauro’s toasty bread is what we expect from an eatery that serves top-notch sandwiches. Combined with their excellent cappuccino, I’ve just started the day on the right foot. Right in the middle of the 17th Avenue strip, but a million miles from Squaresville, it was only a matter of time until the world discovered Tubby Dog. Or at least until the national cable food channel came calling. Filming for the Tubby Dog segment of The Food Network’s You Gotta Eat Here wrapped up today, as wiener-craving clientele mingled with film crew types under the watchful eye of proprietor Jon Truch. I popped in to rubberneck and nom down on a Smokey Smith ($8.50), pictured here. Bacon-wrapped and topped with mustard, ketchup, Dutch mayonnaise, pan-seared onions and American cheddar, it was a gizzardful for sure. Following an on-camera chow-down, CJSW station manager and hotdog lover Chad Saunders mugs it up with a familiar face at the front counter. Asked to pose for a Slop shot, the ironically camera-shy Truch punched this reporter super hard in the solar plexus, then hugged me like a mother gorilla with child. Superstardom hasn't changed our Jon one bit. Earlier this week, The Calgary Herald published a spot-on piece about the controversial demise of the Canadian Wheat Board written by Alberta Farmer editor Will Verboven. Verboven makes it clear that the face of Prairie agriculture is about to change dramatically, but also that urban consumers ought to take note of what's going down on the farm. 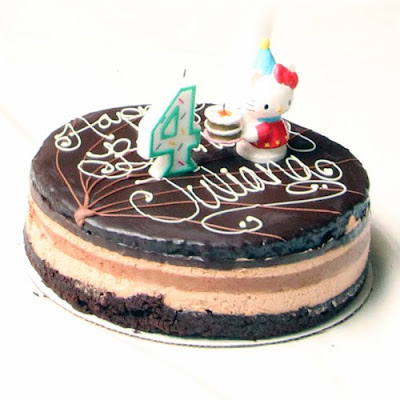 The Chocolate Obsession cake from Decadent Desserts is a staple at every one of my kid's birthday parties. It's neither Nickelodeon-themed nor decorated with assorted cartoon characters (at least at the time it's picked up at the cake shop! ), but what you do get are light and dark layers of smooth chocolate mousse sandwiched between moist chocolate cake and topped off by a semi-gooey ganache. The varying densities and textures of the three chocolatey components enhance the sensory appeal and keep the cake from being a brick of chocolate overload. This treat, sweet but not excessively so, beats the living hell out of any brightly coloured, sugar-frosted product from a chain grocer's bakery, and the unclaimed portion (if any) never ends up drying out in the fridge waiting to be thrown out two weeks later. Fifty-plus bucks for a 10-inch round may seem like a splurge, but price out a themed cake at a big-box grocer, and it becomes pretty reasonable. True dat, George Stroumboulopoulos and Manoj Sood. I once snagged a big ol' rainbow trout (brown trout too wary for my fishin' skills I guess) right under the 14th Street bridge. It became the main course of a small dinner party that evening. Though my guests were worried about the quality of townie fish meat, there are no health concerns linked to eating Bow River fish. One bite and they un-furrowed those brows, I'll tell ya. After a six-year run characterized by alternating high praise and raspberries (the bad kind), French brasserie bistro Saint Germain in the Hotel Arts building on 12th Avenue S.W. has closed. Grayson Sherman really served some excellent food during his stint as executive chef, which ended this past spring. Now there's a man who makes one mean bowl of soup. I'm a big fan. Now vacant, the space will be used as a banquet hall during December says Fraser Abbott, Hotel Arts director of business development. Renovations will then begin for a new 80-seat restaurant owned and operated by the Hotel Arts Group, which also owns Chef’s Table in Kensington Riverside Inn. The new restaurant is tentatively scheduled to open in April, 2012. The casual upscale space will be redesigned, but Saint Germain’s striking wine wall will likely stay put says Abbott. Its heat-lamped bacon may be leathery and the sausages grim, but the business end of the Saturday brunch ($15.95) omelet station at the Danish Canadian Community Club of Calgary’s Mermaid Inn Restaurant is pretty cool. Chef Peter expertly tends a fry-pan assembly line. Pouring beaten egg into each, he prepares individual omelets to order with tomato, shredded cheese, diced onion, creamed spinach, smoked ham and more. A second chef uses a hooked stick to flip hot battered spherical pancakes called æbleskiver in their cast-iron pan. I take two with a spoonful of sweet jelly, foregoing the whipped cream. It’s all the breakfast one needs, but I take the tongs and add a helping of meat. Taking my seat in the bustling room amid white-haired Danish-Canadians, their guests and grandchildren, I enjoy a slow and savoury brunch under the limpid gaze of umpteen little mermaid posters. The rec-room décor oozes the comfortable warmth of tradition. A clear draw of the Saturday meal is the socializing it affords. Cheerful discussion at neighbouring tables touches on the Greenland seal hunt and discreet analysis of Danish cuss words. Table service is likewise personable and chatty if a bit slow-mo. My spinach omelet ain’t fancy, but it is tasty and hits the spot. The æbleskiver are a real treat. I go back for more. Mermaid Inn’s lunch and dinner menus are, of course, heavy on Danish dishes, featuring lots of seafood, smoked seafood, smoked leg of ham, Havarti cheese and French fries. Billing itself as the city’s most popular “private club,” the 11th Avenue institution is open to the general public. Saturday brunch runs from 10 a.m. to 1:30 p.m. and is always well attended. Calgary restaurateurs are doing a better job than ever simply making their places look good, but kol3 has most beat. Sunny, cheerful and cleanly laid out, the room features clustered silver lamps, origami photo-art and pink designer chairs. While fun interior décor doesn’t make the food taste good — which it does — but it certainly elevates the dining experience. Today I’m lunching at kol3 with Slop colleague Ev. From the restaurant’s very concise menu, he’s trying the bacon cheeseburger banh xeo ($12.50) or sizzling crepe, and I’m having the Athena ($12.50). Not on the menu, we’re also trying the kol3 roll ($4.50), a deep-fried Vietnamese spring roll wrapped inside a salad roll. The roll is served with a small dipping bowl of Hoisin-based peanut sauce with a shot of chili sauce on top. Both of us like the simplicity of the appetizer. The roll remains crisp despite the surrounding salad roll contents — lettuce and cold vermicelli in rice wrap. Ev says it brings to mind a classic chip butty sandwich concept. Though, of course, it tastes nothing like French fries and white bread. I’ve eaten and enjoyed the bacon cheeseburger banh xeo and Ev does likewise. All the crepes are served with vinaigrette side salad and fish sauce for dipping or dousing. The filling is a de facto deconstructed hamburger that includes loose ground beef, bacon, cheese, onion, mushroom, tomato and pickle slices. I like it quite a bit, but it’s perhaps a little on the greasy side,” says Ev. “I suppose being a cheeseburger that’s expected! The bacon is nice and crispy and the pickles good and crunchy. The crepe itself is thicker than I expected (last one I had elsewhere was almost paper thin), but holds the contents well. Like its cheeseburger cousin, the Athena shouldn’t work but does. This Greek-Vietnamese dish is a whole other taste sensation. Filled with chicken, onions, mushrooms, feta cheese and spinach, the crepe remains crisp against the steamy greens. Dipping it in the fish sauce tempers the distinct feta taste. This attractive little place has great atmosphere and its menu concept is first-rate. Other Vietnamese restaurants may serve crepes, but kol3 very smartly elevates the dish. Calgary Slop hungrily joins the greater Slop family (Vancouver, Toronto, New York) in cheerleading the greatest grub found in our respective cities. Look to Calgary Slop for news, comments, reviews and feature food stories. Calgary Slop: It's all you can eat!